We all have choices in life. Different paths we could take which will ultimately determine our destiny. Every second of every day we all have to make a decision which has a domino effect on not only our own well-being but on those around us. Makes you think, doesn’t it? In the past few weeks I have spoken about Existentialism, where the individual’s starting point is characterized by what has been called “the existential attitude”, or a sense of disorientation and confusion in the face of an apparently meaningless or absurd world. So, when someone asks why I am on my way to watch Arundel v Pagham in the Sussex County League at 11am on Bank Holiday Monday, that is the answer I give. My choice today was to avoid shopping centres, DIY stores and doing “chores” around the house. Instead I headed down to Sussex for a double bill of football, starting with a visit to one of the most picturesque little towns in the whole of the UK. Arundel is famous for its Cathedral, its castle, the beautiful cricket ground and its mullets, the name given to the locals of the due to their love of German 1980’s rock music. The football club, adopting the nickname of the townsfolk were formed back in 1889, making them one of the oldest clubs in these parts. Miss Success hasn’t been a regular visitors to these parts – in fact the club have never made it out of the County Leagues. But sometimes it is more important to play in the right spirit rather than having a win at all cost mentality. Well, that’s what teams that never win anything always say. Those terribly nice chaps at the Sussex FA once again delivered a treat for the Bank Holiday with all of their games kicking off at 11am, meaning that today was a Sussex footballing fest featuring not just one Sussex derby as Arundel faced Pagham but at 3pm was THE biggest game in the county of the season. 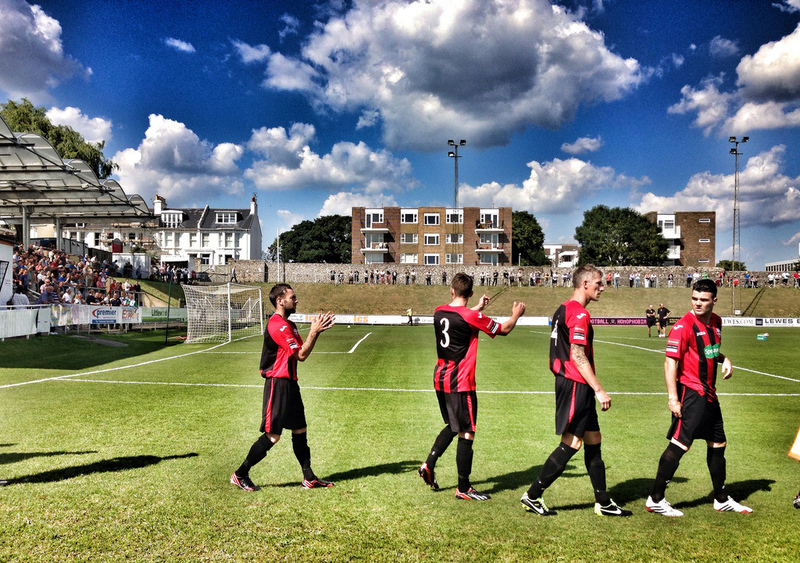 Lewes versus Bognor Regis Town. 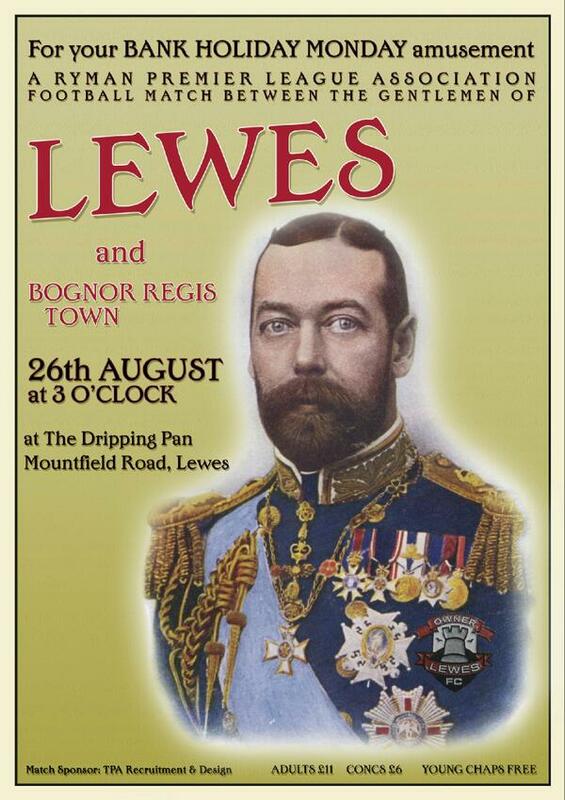 If Brian Moore and The Big Match were still around, they would have undoubtably been at The Dripping Pan, delivering platitudes about the “renaissance” of football in East Sussex and the “wonderful revolution” taking place under the stewardship of Messrs. Wilson and Bloor. We came in search of goals with the Mulletts so far this season being involved in games averaging over five goals a game, scoring 10 goals themselves. Almost a cast iron guarantee for a nil nil draw then. It hasn’t seemed like the locals had caught the footballing bug yet with just 42 souls braving the torrential rain on Saturday in the 4-1 win against Hailsham Town. I’m sure the early kick off would have the locals coming out in droves though for this game. Or perhaps they had made the dull choice of shopping/DIY or chores. 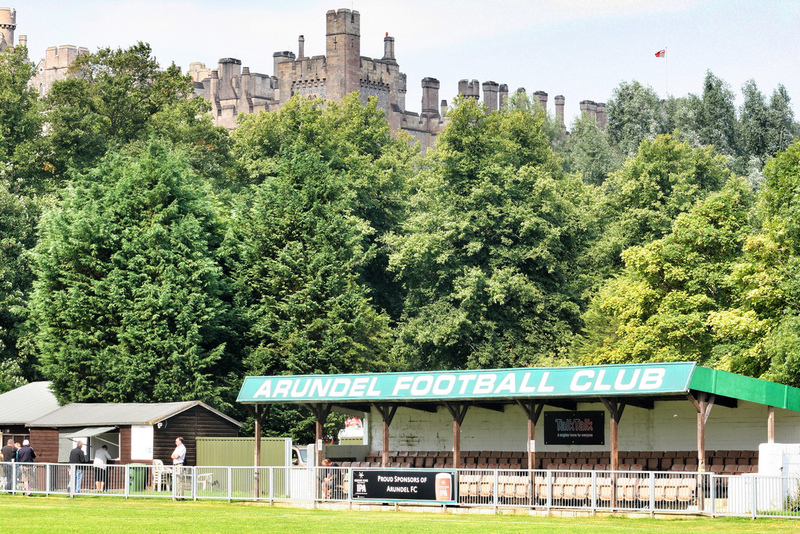 There can be no better place to watch a game on a sunny day with a beer than Arundel. After picking up Mr Last outside EFW Towers we headed west on the A27. We ground to a halt just outside the town centre – it appeared that everyone was heading to see The Mulletts. Well, we could but dream. The West Sussex derby had co-incided with the Arundel festival, which meant lots of people wandering around looking at craft stalls, eating home-made cakes and drinking Elderflower presse. 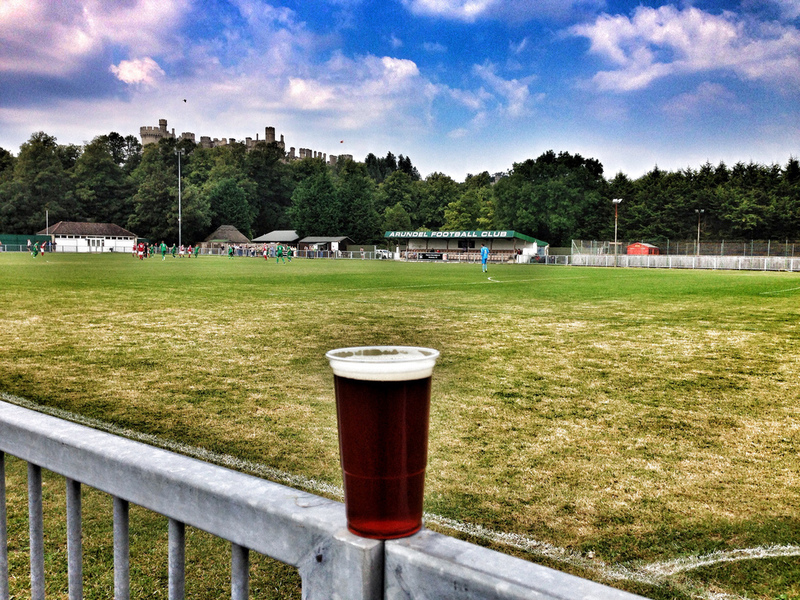 Sad people…I mean who wouldn’t want to be watching a game of non league football with a pint of Arundel Gold in your hand? As 11am kick off’s on Bank Holiday Monday go, this was up there with the best of them. Perhaps it was the sunshine, the wonderful surroundings of the cut of the jib of all action Arundel skipper “Chipper” who scored the only goal of the game, posed nicely for our cameras, should have scored another, cleared one off the line and then had to go off with a big old cut on his head. There is nothing more that I can add that the legend that is Graham Yapp hasn’t already covered on the game here, except perhaps a sly mention of the Pagham shirt sponsors – Ginger Beers. After such excitement we headed east towards Lewes, stopping in Brighton to pick up the Current Mrs Fuller, who had been one who made that choice of shopping ahead of football. Some people, honestly! The draw away at Maidstone United on Saturday had been received too well in all parts. Well, in Kent anyway. Some Stones fans felt that Lewes had arrived to just play for the draw, bemoaning their slowing tactics. But isn’t football all about outsmarting as well as outplaying your opponents? So in this case weren’t Lewes the winners? They had a game plan based on the players fit and available, the conditions and the pitch which they executed on. Last season this fixture produced the biggest crowd in the whole of the Ryman Premier League, played on Boxing Day when there was hardly any transport and the weather was shocking. In fact it came within a whisker of being abandoned as the rain hammered down, soaking the 880+ fans Christmas cheer. With the forecast for sunshine today, the hope was that we would see over 1,000 through the gates for the first time in a couple of years. 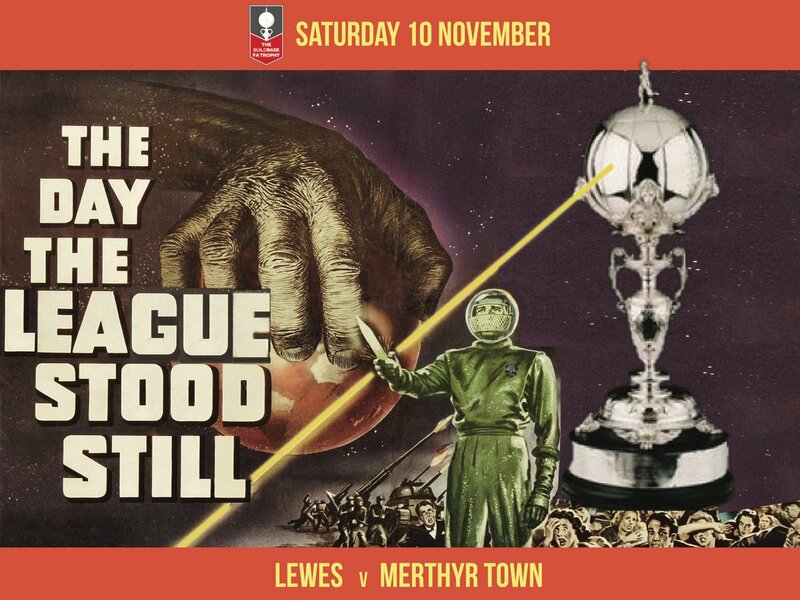 Alas it was almost a case of “after the Lord Mayor’s Show” as Lewes stuttered to a draw against a resilient Bognor side. The game and the conditions at Maidstone on Saturday had taken a lot out of the Rooks and despite an early Jack Dixon goal, Lewes never really pressed to increase their lead until late in the game when the visitors keeper pulled off three stunning saves. A point is of course never to be scoffed at, and the unbeaten run now extends to six games but early in the season where the table is so tight, could these be two points dropped rather than a point gained later in the season? But let’s look at the positives. It was a bloody lovely sunny afternoon, the beer was flowing (CMF was my executive driver home) and nobody could get the right answer to Cynical Dave’s football challenge in the programme. This was the best. day. ever. The craziness of this season is all to clear to see already. Because the league has been increased from 22 to 24 teams, yet the league refuse to extend the season, this was Lewes’s 6th game in just 16 days. It is the same for every club but it is crazy that so early in season where players are still not 100% fit they are expected to put so much effort in. 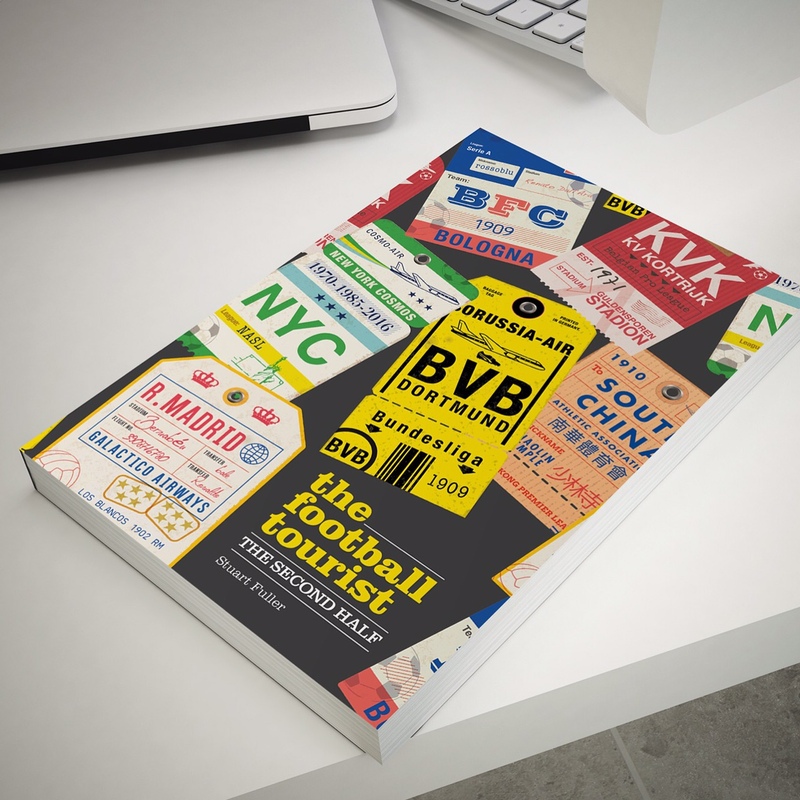 Based on the fact the league didn’t publish fixtures for 10 (ten!) weeks after the end of the season, surely extending it by two weeks would be a sensible idea. Look at me, going down that whole sensible and footballing authorities route again. Bad Stuart! Bank Holiday’s like these only come around twice a year, so make sure you grab the chance with both hands come Easter Monday. This entry was posted in Lewes FC, Non league football, Rymans Premier and tagged Arundel, Bognor Regis, Lewes, Pagham, Ryman Premier League, Sussex County League, Town. Bookmark the permalink.